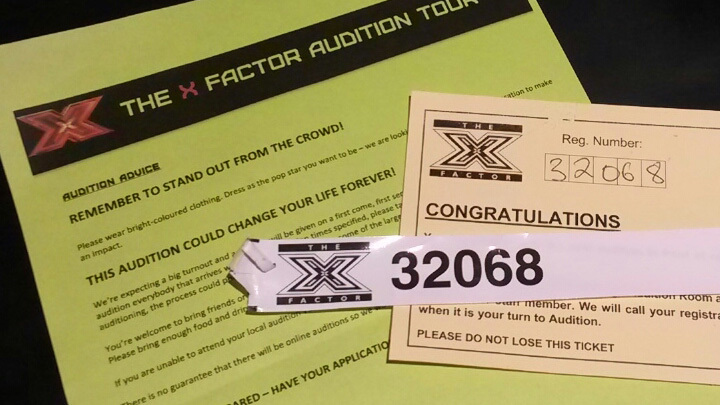 One Year of X Factor: Part 2 – The First Test!! Aaaand… I’ve just walked through the door. It’s early December, 4 days earlier I hadn’t even thought about singing and now I’ve walked through the doors of Flemington Racecourse for an X Factor Try Out. NERVES!!!! But, I’ve decided I’m doing it, so I’ve come prepared. I’ve got my best shirt on, I have a story to tell & I have a voice that I’m going to force myself to let out (please sound good)… Because I have to STAND OUT!!! I’ve even printed my form on fluoro green paper so I stand out even when they’re not looking at me! So I’ve been in a waiting room for a few hours surrounded by all types; cute as couples singing gorgeous harmonies, a brunette bombshell singing incredible soul all mixed in with what I’ll call “a few colourful characters”. My number gets called among a bunch of about thirty.. It’s time. I’m armed with my story & 4 songs; Change Gonna Come – Sam Cooke, Loving You – Paolo Nutini, Riptide – Vance Joy & Valerie – Amy Winehouse (like everyone else, it seems). I stand outside the audition room & can hear everything! The singing, the critique, the parting advice. One by one, each of the 4 hopefuls before me enter the room. “So, what are you going to sing for us today?” … “Let’s hear it” … “You sound good, but keep working & come back next year”. One by one, each leave the room disappointed… And now I’m up. Like a lamb to the slaughter. What in the world am I doing here?? I enter the room, the man I’ve been hearing through the paper thin walls reads my form and asks: “So, what are you going to sing for us today Ryan?” … “Let’s hear it”. You know… I didn’t have to sing it anymore!! Well, I did walk through those doors, I did commit to this..
Will I get through this emotionally? ?